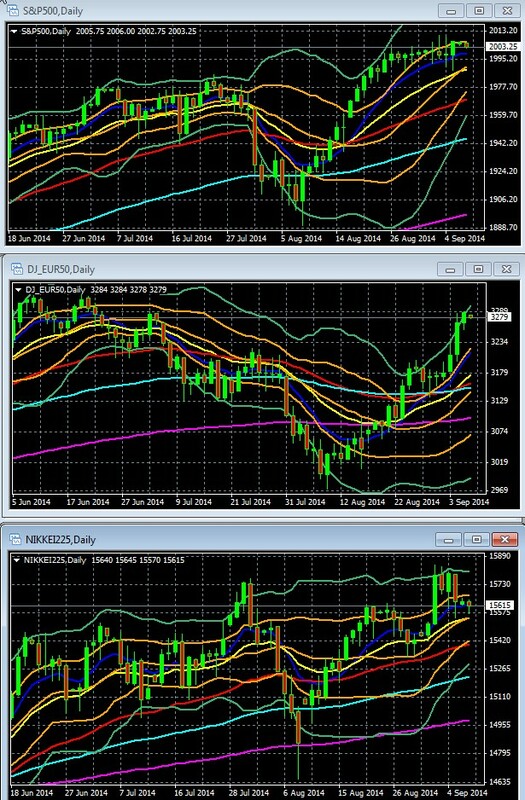 Powered by the surprise announcement of new stimulus coming from the ECB, European indexes have re-joined their US and European counterparts in the double Bollinger® band buy zone, as shown in a sample of the charts below. That suggests the odds favor more upside. 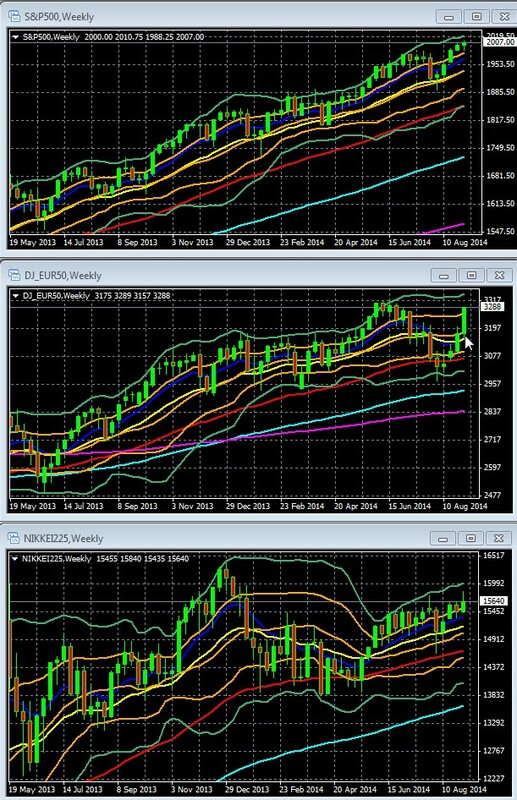 Key For S&P 500, DJ EUR 50, Nikkei 225 Daily Chart: 10 day EMA Dark Blue, 20 day EMA Yellow, 50 day EMA Red, 100 day EMA Light Blue, 200 day EMA Violet, DOUBLE BOLLINGER BANDS: Normal 2 Standard Deviations Green, 1 Standard Deviation Orange. Sure, the EU’s economy reeks like an open sewer, and is burdened with a dysfunctional currency zone that it has proven incapable of reforming (see details on its failed banking union deal here and here for just one example). Yes, the whole Ukraine related sanctions thing could eventually produce another meaningful drag on an already weak economy. So what? The big lesson of recent years is that unless there is an imminent threat to the global economy, you don’t need an especially healthy economy for stocks to rise. The combination of abundant cash and suppressed rates forces investors into equities. It won’t last forever, but what does. 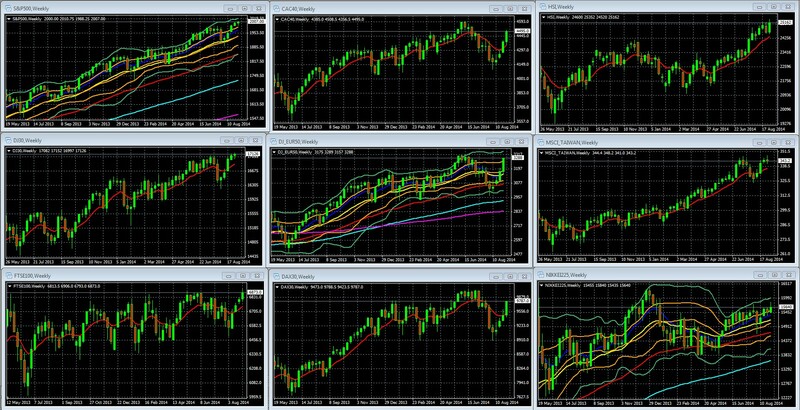 In sum, with most leading indexes continuing to show upward momentum, the odds favor more upside in the medium term. As for near term support and resistance, note that the economic calendar is light this week, and so investors should not expect their relevant index and market to move far beyond the highs and lows of prior weeks. For example, looking at the daily S&P chart below, we’d be surprised to see the S&P 500 close the week above 2020 or below 1990. Readers who are focused on Europe or Asia should apply similar reasoning to forecast the likely trading range in these regions this week. US – Neutral Near Term Outlook: US markets are at the border of their double Bollinger® band buy zone and neutral zone, and have been in a very tight trading range in recent weeks despite the big events in the past week from the ECB and US jobs reports. Thus near term bias is neutral. The same forecast applies to the Nikkei and other Asian indexes for which it words as a decent proxy. Europe – Bullish/Neutral Near Term Outlook: As shown above, the DJ Eurostoxx50, an adequate proxy for major European indexes, is firmly in its double Bollinger® band buy zone, giving it enough near term upward momentum to put the odds in favor of continued upside in the week ahead. Sentiment about the size of the as yet unannounced ABS program (the last big unknown about the new ECB stimulus moves), and thus anything that influences it, should be the key driver for European stocks in the near future. Here’s a rundown of lessons and most likely market moving events to keep in mind for this week and beyond. As has been widely noted, the continued resilience of global stocks has taken a toll on the number of bearish analyses coming out these days. Of what does come out, they typically point to factors that have been around for much of the rally and thus haven’t been decisive (economic performance doesn’t justify all-time highs, assorted tail risks, etc. On the bullish side, the most compelling thing I read last week was a summary of a Morgan Stanley outlook. Highlights include. Very low interest payments on debt burdens, and household debt dynamics suggest a sizable cushion protecting consumers in a rising interest rate environment. 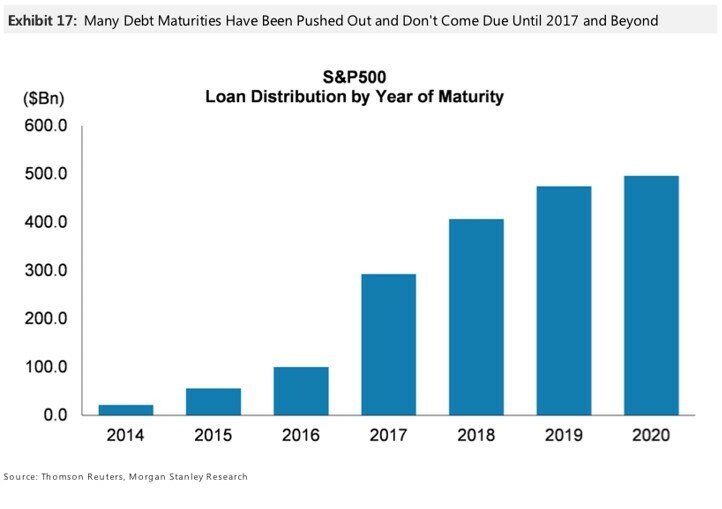 In particular, many businesses have aggressively refinanced at lower rates and pushed out debt maturity dates, giving them added cash cushions for the years ahead. Inventories and capital spending do not appear over-extended. Corporate management hubris and other corporate metrics of overheating remain muted. Several broad economic indicators in the U.S. have only just reached “normal” expansionary levels and are far from looking unsustainable. The report makes the usual, justified nods to tail risks of trouble from slowing in Europe, China, and Japan, as well as these regions’ own debt burdens. The ECB was expected to ease eventually, maybe even talk in general terms about coming measures. It was not generally expected to actually announce a rate cut as well as new plans for additional easing. The results were what one might expect when we get that rare combination of a high-potential market moving event actually providing a major surprise, AND that surprise feeds a multi-month ongoing trend. As I discuss in my book, except for very short term trading and day trading, fundamentals usually drive trends. However there are certain situations in which the technical picture actually influences how markets react to fundamental data. One of the ways in which technical analysis (study of price action) overlaps with fundamental analysis (study of supply and demand factors) is when there is an established trend, because it gives investors a bias to heed news that confirms the trend and to ignore or react less to news that contradicts the trend. There were many important lessons and ramifications from the ECB’s rate cut and new stimulus measures. The big surprise was in the timing. Most investors expected more stimulus steps, but not yet, as the TLTRO program hasn’t had time to make its influence felt. It’s grown so worried about the outlook for inflation and growth that they believe they can’t afford to wait until the new 4 year loans are rolled out later this month. As we’ve noted in recent weeks, at Jackson Hole Draghi admitted that he no longer saw deflation as a temporary problem. What’s changed since then? Continued bad EU economic data, and growing risk from economic sanctions stemming from Russian aggression against Ukraine. Thus even though the full effects of the TLTRO won’t be felt until November or December, clearly the ECB no longer thinks that the TLTRO will be enough to revive the deteriorating EU economy. Remember that the central bank has been criticized for months in much of the European financial press for doing too little too late in the past and once again being too slow to react to the mounting evidence of the EU’s economic stalling. The ECB no doubt sees the better US economic performance and is coming around to the Fed’s preference for erring on the side of more stimulus rather than less, especially with deflation concerns replacing inflation concerns, even for the inflation-phobic Germans. There were many more lessons and ramifications, most of them relevant to virtually all investors regardless of their focus. See our Weekly EURUSD Outlook for details, as well as for background information and a summary of the new steps. As we predicted last week, the combined impact of the NFP and unemployment reports were minimal, at most, it provided an excuse for a modest counter move higher that still leaves the pair sharply lower on the week. Why did these reports fail to move the pair up much, despite the theoretical weakening of the USD because weaker employment reports should delay USD-supportive Fed tightening? The short answer is, that the jobs report changes nothing in the Fed’s policy and thus in perceptions of the value of the USD. First, while the headline NFP figure missed (142,000 new jobs in August, versus an expected 230,000), there was some good news too. –The unemployment rate dropped to 6.1% from 6.2%, per the latest release from the BLS, and was in-line with expectations. 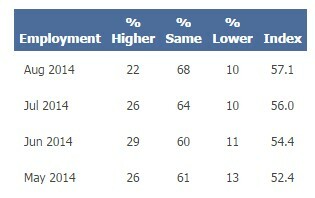 –Wage growth was also in-line with expectations, with wages growing 2.1% year-over-year, and 0.2% month-over-month. –The average number of weekly hours worked held steady at 34.5 hours. –The “U-6” unemployment rate, which includes those marginally in the labor force or those employed part time for economic reasons, fell to 12% from 12.2% in July. Second, Fed Chairperson Yellen has long made clear that Fed policy moves with longer term data trends, not the somewhat erratic single monthly data points. The Fed is already skeptical about the health of the US job market even with the recent string of overall good data, so this month’s NFP miss merely confirms that view. With US data continuing to show improvement, only a smashing beat of forecasts could have aroused speculation that the Fed might view US unemployment as improved enough to warrant faster, greater tightening. In sum, the reports didn’t pack enough of a negative surprise to change sentiment about the pace of Fed tightening. Meanwhile, the ECB is indeed accelerating its easing, so the USD continues to look better relative to the EUR. See below for lessons on this. Friday’s very modest EURUSD bounce, plus the gains logged in most leading global indexes, both reflect a consensus that the reports didn’t change anyone’s perceptions about US growth. The NFP miss was just one month’s data and NFP data can be “noisy” with outlier monthly data not uncommon. Most of Wall Street does not believe the report influenced the Fed’s likely timing of its first rate hike in Q2 2015. There were some positives: the unemployment rate fell to 6.1% from 6.2%, wage growth was in-line with expectations, growing 2.1% year-over-year and 0.2% month-over-month. There is no significant data showing slowing labor demand. 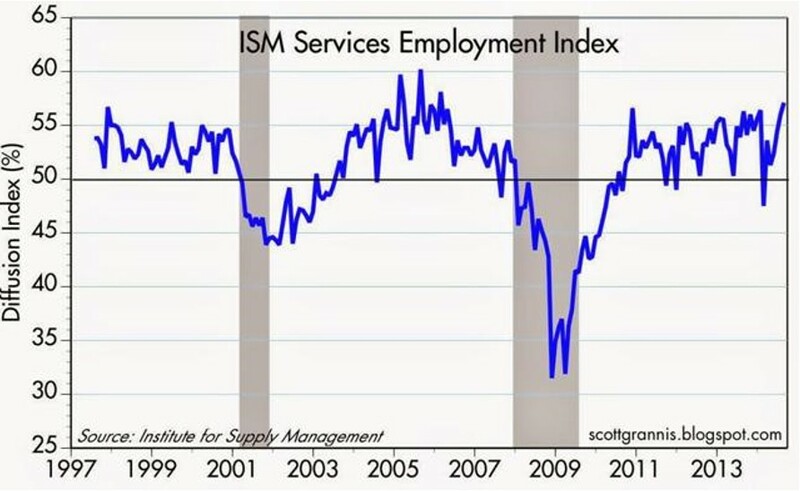 For example, the jobs component of last week’s ISM services PMI survey is rising and approaching multi-decade highs. Here’s a classic illustration of the importance of inter-market analysis. The EURUSD fell due to yet another batch of poor EU PMI reports, thus strengthening the USD. That boost in USD demand often boosts the USD versus its other key counterparts, like the JPY. Sure enough the USDJPY spiked, That weakness in the JPY boosted Japanese stocks for their biggest weekly gain, as a cheaper Yen helps the all-important Japanese export sector. True, a planned cabinet reshuffle by PM Abe was also seen as supportive of higher stock prices, as it was seen as giving a boost to further pro-spending and growth reforms within the overall Abenomics program. Stocks are risk assets the rise with market optimism and fall with pessimism. 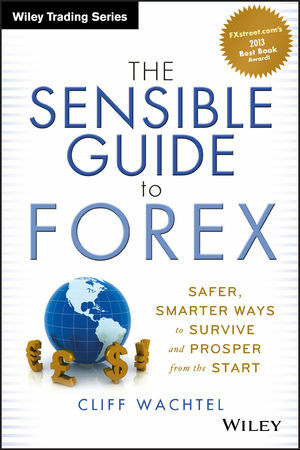 The USD is still regarded as more of a safe haven currency, meaning it tends to rise in times of fear. Thus the two usually move in opposite directions. However, when the good news that boosts stocks also raises the chances of tighter fed policy (which in theory reduces or will reduce the supply of US dollars vs. demand and also raise US rates, which further feeds USD demand), then both stocks and the dollar can and do tend to rise together. News of escalations and de-escalations continue to have influence. As Russia appears intent on escalating, the bearish escalation pressure is more long lasting because that is the long term Russian policy for now. However signs of calming have tended to produce rallies until those signs are shown false. Again, it’s a relatively light calendar, but here are the things most likely to move most global asset markets (we omit events with only regional or national impact). US: Weekly new unemployment claims. Relevant only to the extent that it influences the 4 week moving average and longer term trends for this metric, because the Fed is looking at these longer term trends rather than weekly or monthly data. US: Retail sales m/m, preliminary UoM consumer sentiment, business inventories (remember, much of the recent GDP beat was attributed to inventory buildup, so we want to see if inventories are getting sold or setting up to become a drag on the next GDP reading as payback. What will be the size and scope of the ECB’s coming ABS purchases, and how much of the coming details will already be priced in before the ECB reveals the details? Will we get any major surprises from the top market moving events of the above calendar? Will the coming round of economic sanctions between Russia and the West start to actually impact the global economy? Will US retail sales and UoM consumer sentiment continue to the upbeat trend in US data? Is there any real chance the October 17th FOMC meeting will reveal anything new? ← EURUSD Weekly Outlook: EURUSD Finally Primed For A Bounce?